Kingfisher, the home improvement company, believes that a good home is a sustainable home. As part of its journey to become a net positive business by 2050, Kingfisher recently launched its sustainable growth plan which sets out its sustainability targets for the next seven years. These targets aim to drive lasting change by translating sustainability into a language that connects with customers and the real concerns they have in their homes. To do this, the plan establishes four big goals which challenge Kingfishers’ own operations and make it easy for customers to live more sustainably. These goals are: saving money by saving water and energy; living smarter by getting more from less, re-using or using longer; creating a healthier home and connecting with nature; and being part of a community that helps millions more people improve their home. Kingfisher has already gone a long way in making sustainability the easy choice for its customers as its latest sustainability report shows. 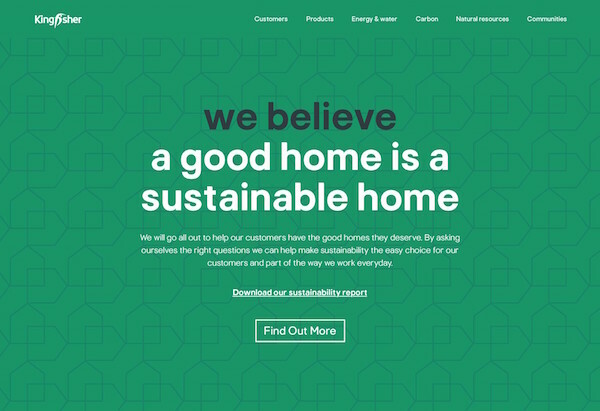 In 2017/18, 32% of its sales came from its sustainable home products – those that help customers create sustainable and good homes. A 16% cut in Kingfisher’s absolute carbon footprint since 2010 and the launch of its first zero-energy Trade Counter store in the UK. Read more about their progress in 2017/18 in this year’s sustainability report, published today. Kingfisher plc is a home improvement company with nearly 1,300 stores in 10 countries across Europe. It employs 78,000 people and nearly six million customers shop in its stores and through its websites and apps every week. Kingfisher’s ambition is to become the leading home improvement company. It believes everyone should have a home they feel good about, so its purpose is to make home improvement accessible for everyone.